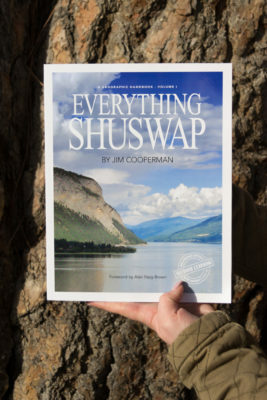 One of British Columbia’s most diverse regions of lakes, rivers and inhabitants, dating back over 9,000 years, is in the spotlight of Everything Shuswap, local author Jim Cooperman’s newest book. Volume one of the geographic handbook features a stunning array of stories and photos, including maps and graphs detailing the Shuswap’s lush and fertile lands. The first chapter of the book giving an extensive look at the local watershed, exploring the many lakes and rivers of the region. Cooperman also dives into the history of the indigenous Secwepemc peoples that first inhabited the land. Featured in this fourth chapter are photos of artefacts, some close to 9,000 years old, found in the area, along with the uses for these early tools. The chapter also recounts traditional Secwepemc stories, their customs and habitations in the area of the Shuswap lakes and surrounding areas. This history is traced and continued through the Fur Trades, the Gold Rush and even tells of experiences in the tragedy of residential schools. The final chapter of the book chronicles the early European settlers that travelled to the Shuswap area during the Fur Trade and the proceeding Gold Rush that swept over BC around the 1860’s. Cooperman has included many journal entries and many man-made maps created by the Fur Traders and Explorers attempting to mark the geography of the area. Many contributions had been added by various explorers, aiding the final maps of the area by marking the Shuswap’s many lakes, river and mountains. The volume goes on to detail the use of steamboats on the interior lakes that provided quick travel and aided transportation of logs between logging sites and mills. These logging efforts had a major impact on the construction of the railroad that finally made its way to the Shuswap after 1885. Everything Shuswap is the first comprehensive book about the area. Cooperman’s extensive work capturing the rich history of the area in his first volume is seen on every page of the book, complete with striking and detailed imagery from past and present times. With the succeeding books in the series looking at the impacts of climate change, overdevelopment and what the future holds for the Shuswap area, the Everything Shuswap collection is a must-have for anyone interested in learning more about one of British Columbia’s oldest and most beautiful regions.